SHB hydraulic buffers are used where moving masses are to be decelerated in order to keep the forces occurring during the buffer impact as low as possible. The SHB hydraulic buffers maximize their kinetic energy in terms of their size and weight and convert them into the lowest possible buffering force, depending on the buffer stroke, even under the most difficult operating conditions. 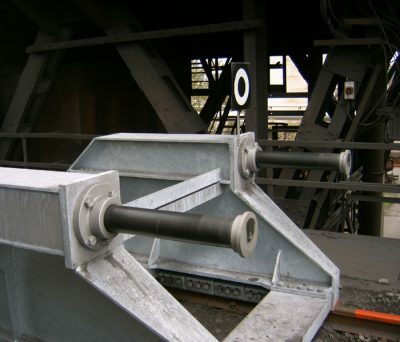 SHB hydraulic buffers KP are used for damping moving masses (eg cranes, cats, carriages, etc.) in order to minimize the impact in case of emergency situations. For example caused by the opposition of two cranes or the approach when reaching the end of the crane rail. 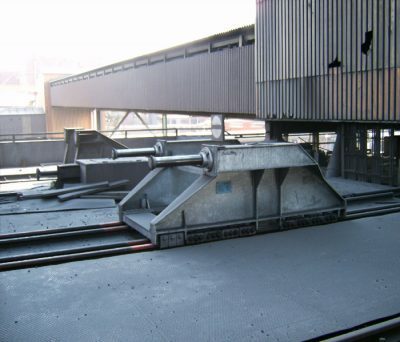 The buffers’ hydraulic throttling system, which is tailored to each specific application, ensures the best possible protection of the approaching vehicles and the respective connecting structures (eg factory buildings) through optimized force-displacement curves. SHB hydraulic buffers EP are used to damp moving moving railway vehicles (eg wagons, locomotives) in order to minimize the load on vehicles and cargo during operation, whether it is shunting or loading when driving train formation or arise during coupling operations. Due to the choke system used, the buffers can be adapted for special applications and for driving situations that deviate from normal operation. For the hydraulic combination shock absorber EP 70, the EBA acceptance according to § 32 EBO is available for use in sleeve buffers of category C according to UIC 526-1.